Mind Game is a trip. Struggling to describe it in my book 100 Animated Feature Films, I called it “spectacular, spontaneous, confusing, kooky and hilarious.” It’s also dense, packed with so many dizzying visual ideas screaming for a rewatch. Its visual style is freehand, lopsided, a virtuoso exercise of virtuous sloppiness. Its story is a crazy fantasy about one man and his thrown-together companions discovering themselves, finding the meaning of their lives. But the film starts – after a typically giddy montage of “random” scenes to be pieced together over several viewings – as a kind of romcom. Our hero is a loser, twenty-something comic artist who happens to bump into his old school sweetheart on a rainy Osaka night. He ends up in the bar she runs with his sister, fuming over “his” girl’s handsome boyfriend like the epitome of all sad losers. And from that point… Chaos reigns. For many fans, Mind Game was the introduction to a remarkable new anime talent, director Masaaki Yuasa. Two of his later TV opuses, The Tatami Galaxy and Ping Pong: The Animation, have been released already on British Blu-ray by Anime Limited. 2017 saw Yuasa in overdrive, directing two features: Night is Short; Walk on Girl, which has links to Tatami Galaxy, and Lu Over the Wall, about a boy and a mermaid. It was followed this January by Yuasa’s reinterpretation of Go Nagai’s Devilman, called Devilman cybaby (trailer), released on Netflix. Mind Game, though, is the work where Yuasa consolidated much of his style. No newbie, he’d already been working in the industry for 17 years, often on “unconventional” anime. He animated and designed on many of the Crayon Shin-chan films, which have a style unto themselves; he also had creative credits on Cat Soup, a creepy, freaky animation that’s like Hello Kitty meets Svankmajer. Yuasa is a fan of world animation, citing Tex Avery, Yellow Submarine and the pioneering stop-motion of Ladislas Starevich among his influences. This acceptance overlaps with the rise of “sakuga” animation fandom. It would be silly to say you can’t have creative animation in something like Howl – look at this, for instance – but Mind Game’s spontaneous, anti-real ethos is something else. Aside from Yellow Submarine, it’s close in spirit to the films of Ralph Bakshi, especially in the abrasive violence of Mind Game’s early scenes, culminating in the hero getting shot. In particular, there are point of comparison between Mind Game and Bakshi’s 1973 Heavy Traffic, another toon about a struggling comic artist, his fantasies in the raw and the lives he could lead. Within anime, you could slot Mind Game into a broad tradition ranging from Belladonna in the 1970s to Shaft’s ongoing Monogatari franchise. One of Mind Game’s weirder ideas, animating what look like photos of real people’s faces, anticipates a Mamoru Oshii movie, The Amazing Lives of the Fast Food Grifters. These works disorient and discomfort, set in cartoon surrealities that bend and transform and contain mad, inconsistent multitudes. They counter the tradition of anime which feel like they only happen to be animated, discussed here. 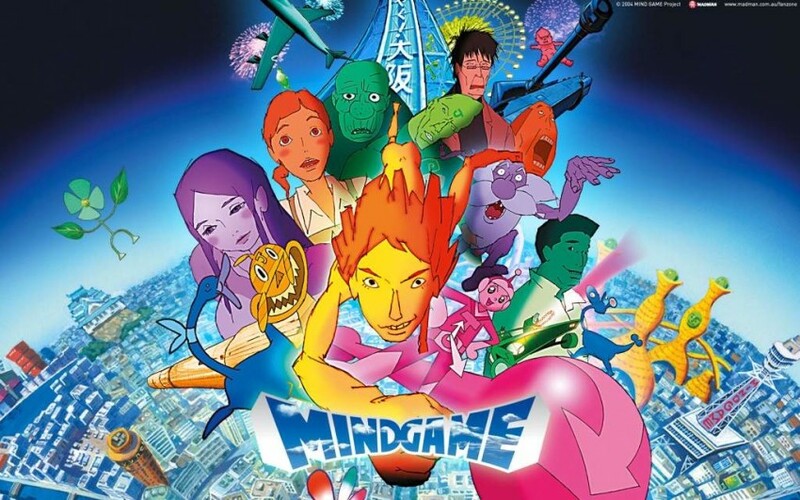 Mind Game is released in the UK by Anime Limited, and is available for purchase on Blu-ray now. Anime Limited acquires "Penguin Highway"